Background checks are necessary. There is a reason you are screened before buying a car, a gun, or getting hired for a prestigious new job. Pre-qualifying contractors and subcontractors is one of the most important steps in reducing risk associated with construction projects. It is crucial to outline the expectations of a contractor in order to make sure they can handle the work you want them to do. At PFCS we have found that pre-qualifying contractors is an important step in our own unique system for hiring. In a blog post called "Avoid Bad Contractors: Basic Due Diligence in Hiring," Pete Fowler outlined 17 crucial steps in order to hire a good contractor. Pre-qualification falls on number 8. It is such an important step that it has seven sub-steps for ensuring the pre-qualification process is done thoroughly. 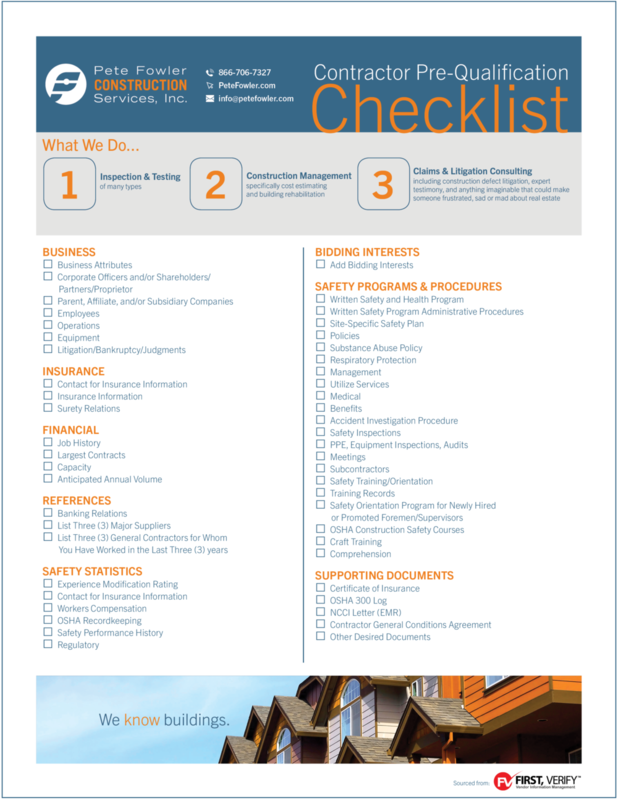 The following is a checklist compiled by FIRST, VERIFY that details the important steps in pre-qualifying a contractor. Click here for the original checklist from First, Verify.